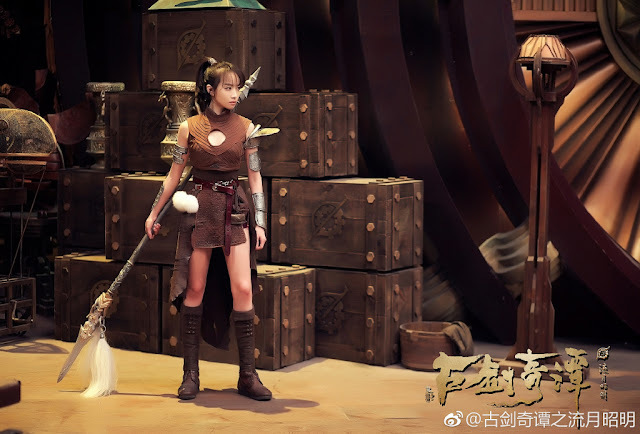 The first stills of the Sword of Legends Movie 古剑奇谭之流月昭明 are out and Victoria Song is shown in full gear as the spear-wielding heroine. If I thought her character resembled that of Li Luo in Ice Fantasy before, then I am even more convinced now except she dons a much more form-fitting outfit, one that shows off her killer legs. She is looking both alluring and badass, I really love it. The four main characters are captured together in one scene, vigilant and ready for battle. Victoria Song's Wen Ren Yu bravely stands in front of the pack that includes Leehom Wang, Godfrey Gao and Karena Ng, embodying her role as a fearless defender. The movie is still in its post-production phase and is estimated to air in 2018. Sorry about the late response, I'm just catching up on the comments section. Lol u crack me up, I whine along with u. at least these dramas are all for the future, i'm still on a break from dramas and resting my very tired eyes, itching to start one tho.